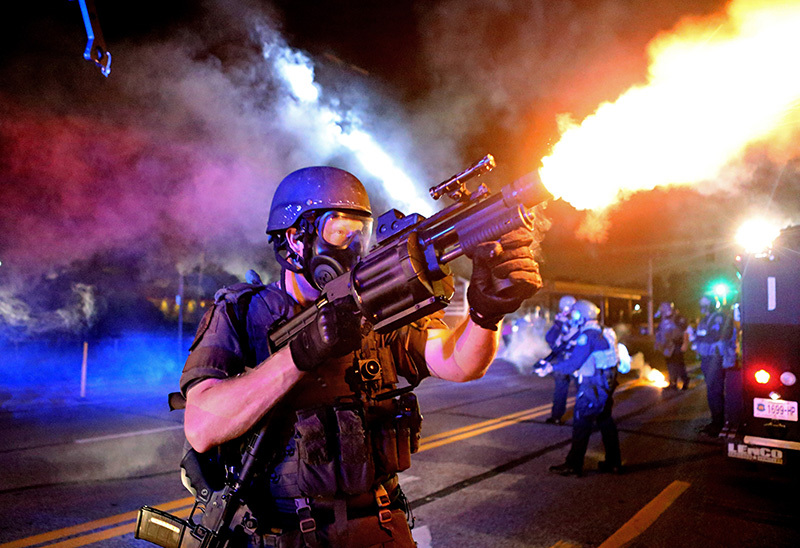 A member of the St. Louis County Police tactical team fires tear gas into a crowd of people in response to a series of gunshots fired at the police during demonstrations along W. Florissant Road near the QuikTrip in Ferguson, Mo. on Monday, Aug. 18, 2014. Protesters also threw bottles and rocks with at least one rock striking an officer in the arm. Protesters and police clashed almost nightly for more than 2 weeks during the unrest that followed white police officer Darren Wilson shooting and killing unarmed Michael Brown, an 18-year-old black man.